Why is my fence heaving out of the ground? You are here: Home / Fence School / Why is my fence heaving out of the ground? Cement is a powder, usually sold in a paper bag. When you mix it with water and sand and rock, it becomes concrete. 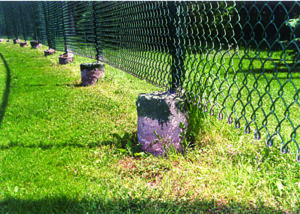 Posts properly set in concrete can last a long time…but most posts are not properly set. To properly set posts into concrete requires first digging smooth sided deep holes to get below the expected frost line– In Wisconsin about 4 feet. That depth varies according to soil type and ground cover. Then you have to make the bottom of the hole bigger than the top. This is called “bell shaping”. While doing this you have to be careful to keep the sides nice and smooth. In loose soils this becomes impossible so then you have to add a “sonotube”—another expensive and time consuming item. Then you have to clean up your mess of dirt and spilled concrete. And wait a day for the concrete to set before you can continue building the fence. Another proper way to set a post is driving a smooth steel post 4 to 6 feet deep. The smoother the sides of the post, the better. Just like with a concrete column, if there is a rough edge for freezing ground to grab the post, it will. If the weather would turn very cold at Christmas time and stay that way and warm up at Easter, posts would stay in the ground better. However, what happens is that water often runs down beside the post or column. Night comes; water freezes, and expands in every direction. But the easiest way for the water to go is up, so it takes along with whatever it is attached to. Maybe it only moves 1/32 of an inch, but in 32 days that is an inch, and after 5 years you have a failure. In conclusion: When you properly set a fence post it has to be designed to do its job of holding the fence upright year after year, considering wind load, frost jacking, people pressure, animal pressure , corrosion resisting, etc.